Have you have seen our “his and her gift guide“? It is perfect for some ideas to spoil your loved one with the upcoming holiday! Switching gears, I have been obsessing over the casual and more formal Valentine’s Day! With that, I just have to share a few of my favorites with you! I separated this into two sections. You notice the first half is more casual and ending with a bit more formal! Both sections catering to different budgets! I personally love Valentine’s Day! Another excuse to dress up and go out to dinner with my husband definitely puts a smile on my face! If going out with a significant other this month is not in the stars for you, don’t forget about Galentine’s Day! What is Galentines? Galentine’s Day is celebrated the day before Valentine’s Day and is to be celebrated with your girls! 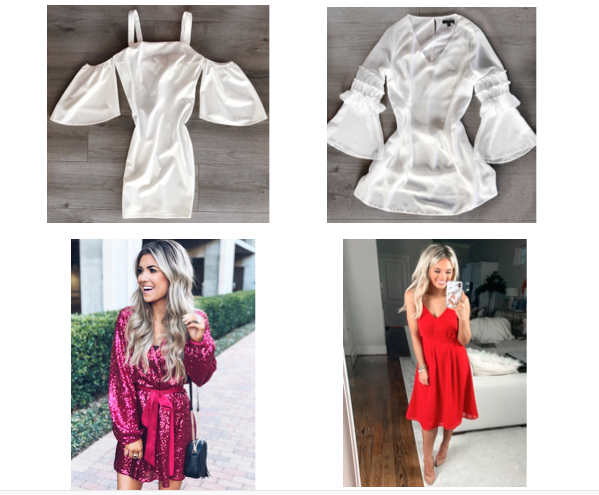 So whether you are going out to dinner with your significant other, or the girls these outfits will sure have you ready for whatever you have planned! The perfect day or night time look. 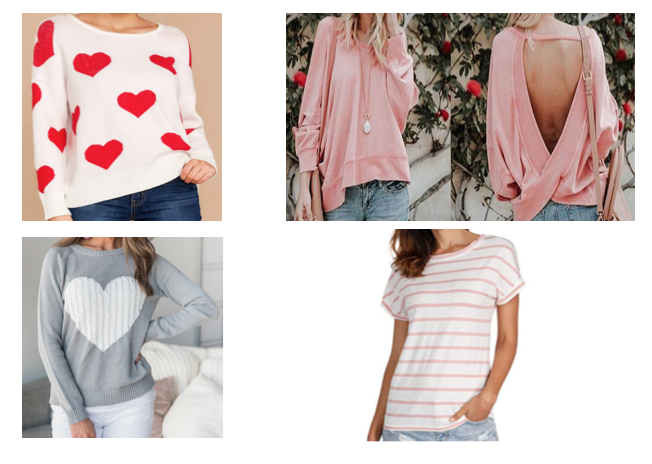 I have been eyeing these Valentine’s Day sweaters for a few weeks now. If you are a teacher, or your job allows for casual attire these are PERFECT. Secondly, they can easily be dressed up with faux leather leggings and Sam Edelman two-strap heels… amirite. White Heart Print Sweater Perfect for the day time! Can be worn to work with slacks and flats, or jeans and sandals. Heart Grey Sweater I have had my eye on this sweater for a few weeks now. I love how it is paired with white jeans. Also is perfect for transitioning to a night time affair. Backless Loose Long Sleeve I personally have this exact top in green. The quality for the price is worth it, plus its a PRIME item! White and Pink Striped T The ultimate casual top. Subtle for Valentine’s Day, but also great to reuse for a later time. Specifically geared towards the more formal affairs, some of these pieces would be perfect to reuse for the bride to be! Featuring a local boutique in the Downtown DeLand Historic District just 50 minutes north of Downtown Orlando is Shellsea. I love shopping as much as the next gal, but what I love about Shellsea is their unique style and pieces that I can see on social media, but then try on so I know the size and fit. Nothing is worse than ordering clothes and having to return it because you chose the wrong size. Did I mention Shellsea gets in 50 plus new items each week? You can always count on them to have something unique for a bridal shower or rehearsal dinner. Shellsea has been so kind to give our readers an exclusive discount code for the two white dresses featured here!! Use code AATR15 at checkout! Code expires 2/28! Aisle Impression White Dress This darling dress is perfect for a candlelight dinner. Use code AATR15 at checkout! Sequin Dress I am obsessed with this pink dress! Worn by my favorite blogger @livingmybeststyle. Sway With Me White Dress Can we agree this dress would look great Tory Burch Millers or Sam Edelman two strap? Out to dinner or a bridal brunch, this dress this ideal for either occasion. Use code AATR15 at checkout! House of Harlow Red Dress Dare to wear red? Worn by another favorite blogger @champagneandchanel. Let us know what you are doing this Galentine’s / Valentine’s Day! More on this shoot can be found here!